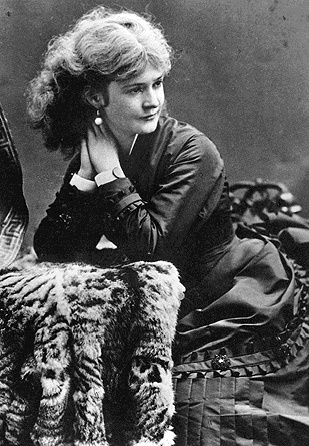 One of her defining physical features was her thick, somewhat unruly hair. They used pomatums, powders, and oils frequently, but loathed to use soap on their hair because it is very drying and disrupts the natural system of oils in your hair, kind of a “hard-reset” for your scalp. 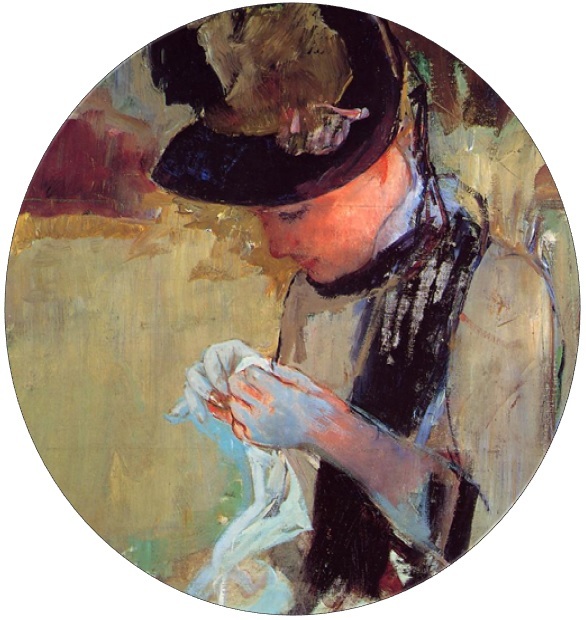 In fact, soap was considered a last resort for only the most dirty of hair situations. If they were putting all that stuff on their locks and never using soap, they must have been pretty disgusting, right? Not necessarily. I love this photo because it shows a variety of hair types, textures, and colors. Remember that old tidbit about brushing your hair 100 strokes or so before bed each night? Everyone these days brushes it off (ha ha!) as a myth and screams that the 100 stroke method is horrid for you hair, causing split ends, flyaways, and even baldness! And they are right…but oh so very wrong. You see, such claims are for women who wash their hair frequently with modern shampoos and use plastic brushes to detangle their hair. If you brush your modern-treated hair vigorously with one of those brushes, it will create static and lead to snarls and frazzed locks. But those that claim the 100 strokes is an outdated practice are ignoring the fact that many modern women have begun to go shampoo-free, just like our ancestors! How do they do it without their hair being weighted down with all that oil and gunk? 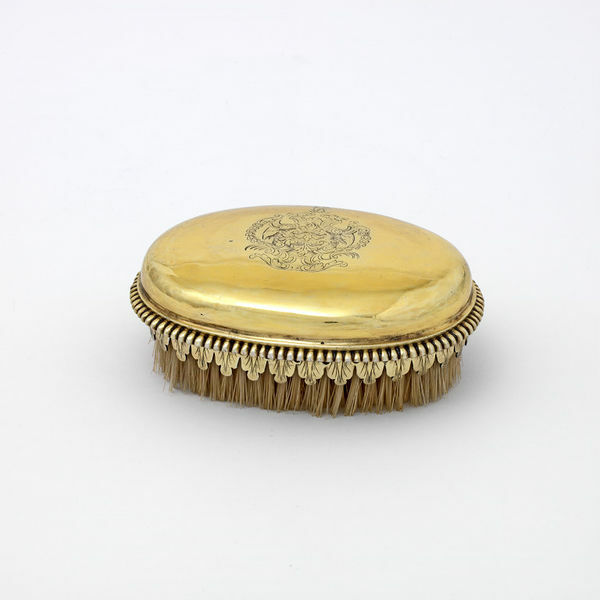 Before plastic brushes became the norm, all brushes were natural-bristle brushes. A woman’s vanity set would include one or two combs to take the tangles out of her hair, then a natural bristle brush to style and tame it. A bristle brush is not a detangler. It distributes the oils throughout your hair that would otherwise accumulate at the roots, smooths flyways, and cleans the dirt out of your hair. Unlike some of the modern “myth-busting” pages that recommend a sparse bristle brush, you actually want the opposite. 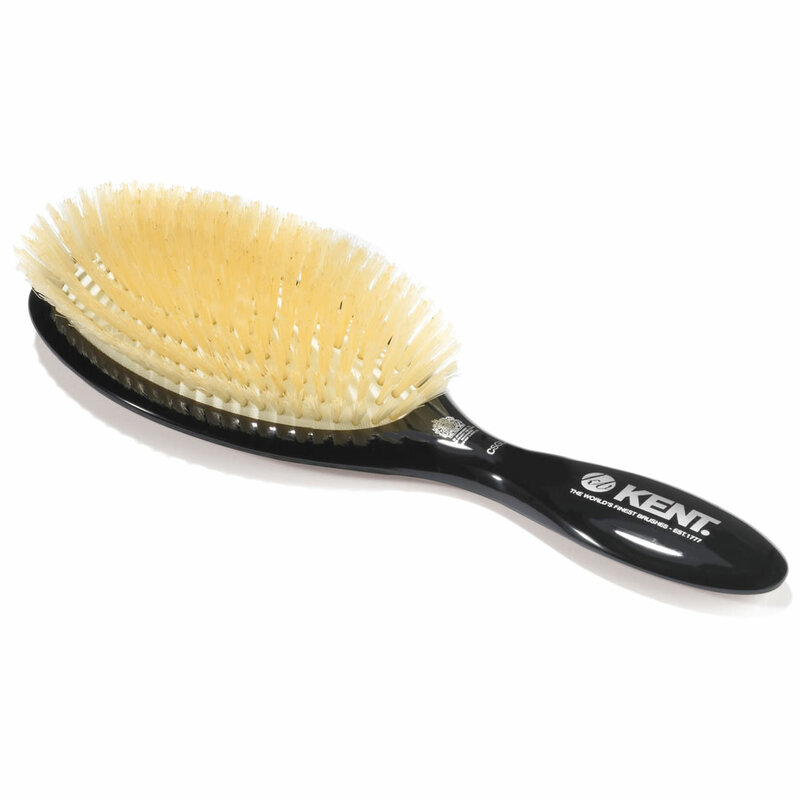 A brush with a wide, dense pad of soft-to-medium bristles is much better for your hair than the tight, stiff clumps on many modern brushes, but it doesn’t have to be as expensive as the uber-deluxe Kent brush above. I have a wood-handle, oval paddle brush from Conair that I got for $6 at Walgreens that works really well. Baby hair brushes are also a good choice if you have thin or brittle hair since the fibers are often softer than regular boar bristle (just make sure they are natural fiber and not plastic). You start at the roots and in long strokes, pull the brush down the hair shaft. It really does make your hair silky smooth, but it takes time, especially if you have long hair! 100 brush strokes is actually too few in some cases! I’ve started using my boar bristle brush on the days that I don’t wash my hair. I wake up an oily mess, but with 3 minutes of brushing in the morning and at night, it does it get very soft and the hair becomes slick, but not greasy. 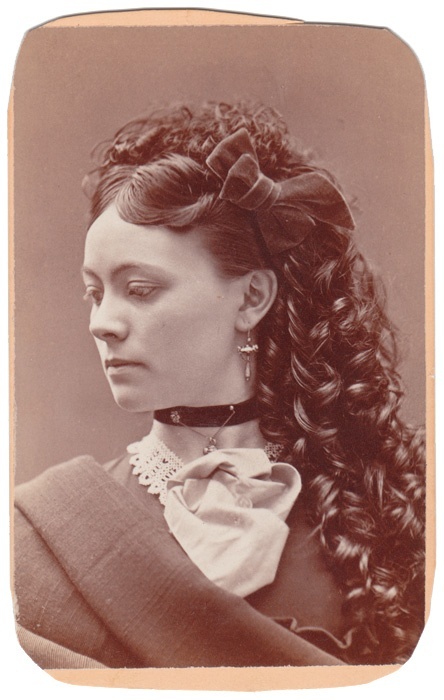 A lot of historical hairstyles that would otherwise require lots of holding sprays or tight curls, like 18th century pompadours, 1830s sculpted buns, and 1870s updos, are easier to achieve with natural-state hair. Brushing your hair with a boar bristle brush also changes how your hair behaves. 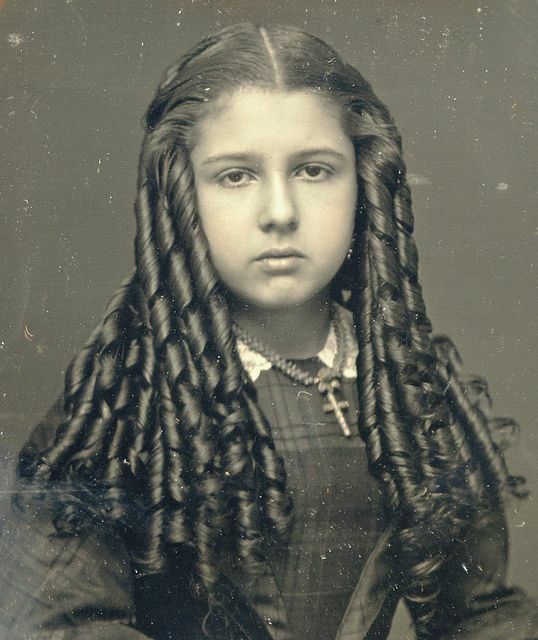 In many of the photographs of Victorian women with long hair, you’ll notice that it’s lightly wavy and feathers as it near the ends. In the modern world, we call this the dreaded tent hair! But healthy, long hair naturally takes this shape if properly cared for. It looks dry to us, but that’s because we are used to applying heavy (often silicone based) conditioners on the ends while having stripped hair at the scalp. Our ancestors had the opposite situation: natural oils near the base that lessened down the shaft towards the ends. In fact, daily shampooings are relatively new. Up until the 1960s, women would wash their hair only once week or so. Here’s a fabulous hair care video from the 50s demonstrating proper hair care for the era, including “frequent washing,” which in this case means every two weeks! I’m still technically in the transition phase during the process, so my hair gets oily, but I can tell my hair’s developing texture is much different from my previous one. 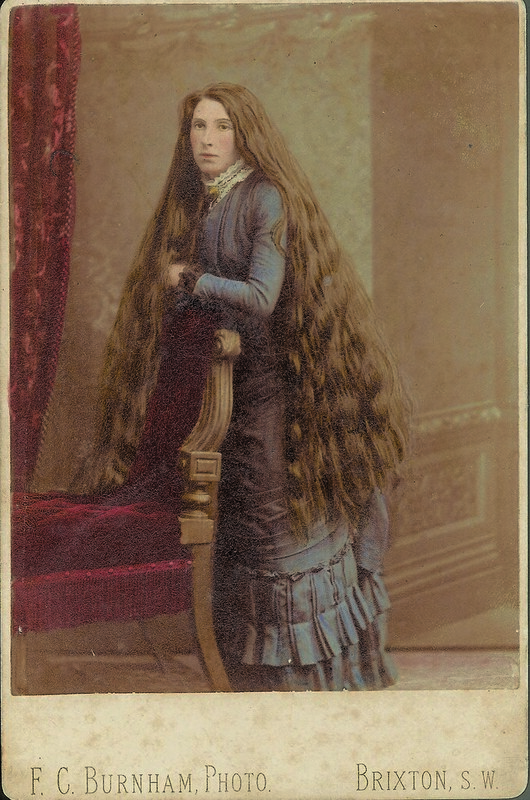 It looks much less like a Pantene ad and more like Victorian hair– smooth and close-laying on top and feathered at the ends. Thanks to over a century of being conditioned (ha!) to think that natural body oils are bad for us and that our hair should fluff four inches high on our scalp, it’s hard to trade that squeaky, perky clean for your hair’s natural character. Of course, results are not instant. First, your scalp has to adjust to not being super-stripped, so it will be enormously greasy for the first few weeks. After your hair and scalp adjust to the new regimen, you may find out that your hair is entirely different than you’re familiar with! Sadly, it will probably not give you magical curls or volume if you naturally don’t posses those features, but people who fully embrace the historical or no-product haircare lifestyle report that their hair grows faster and doesn’t suffer as much breakage as before. I don’t think I’ll ever be able to fully let go of my shampoo and conditioning ways, but for now, it’s fun experiment! 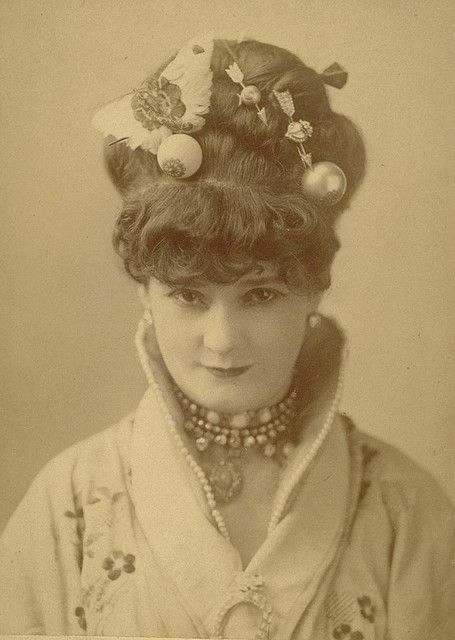 Victorian ladies did not have access to hairspray, but they did use styling oils, waxes, and creams to help hold their hair in place if the natural sebum in their hair was not enough. 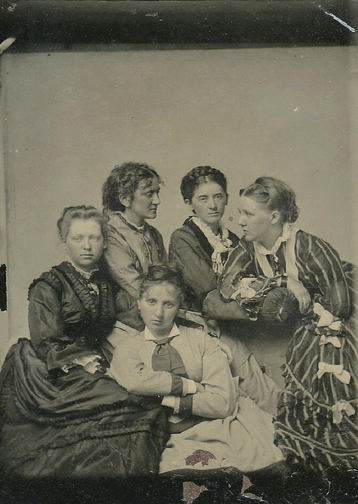 They also had access to chemical treatments, but many ladies dared to risk them, especially since cosmetics were not as heavily regulated as they are today and could be quite harsh. Curling irons, however, were nearly universal and were heated near the stove or a lamp. You have to be really careful not to burn your hair with one! Anyway, my point is that the 100 brush-stroke myth is not a myth. It just requires a specific tool as a caveat. 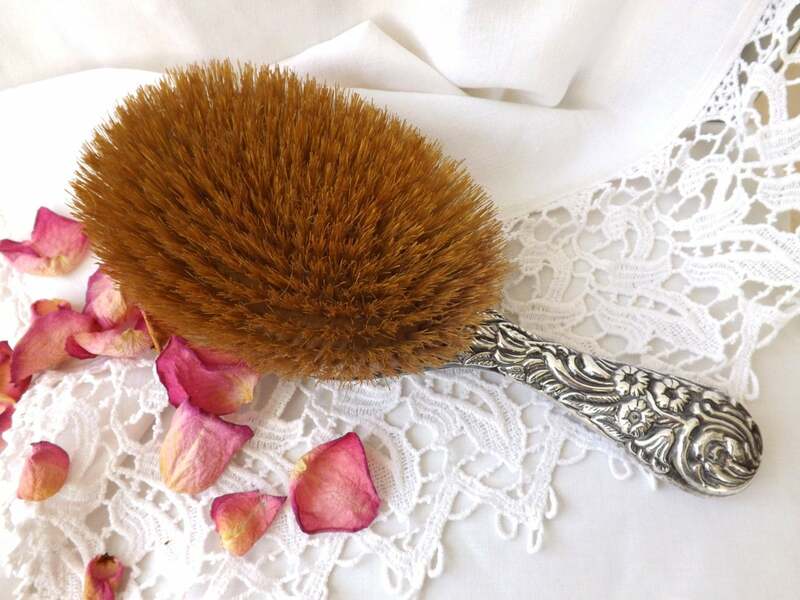 A boar bristle brush is good to have for any occasion, not just for ladies who dream of floor-length locks! It’s one of the simplest additions to a any hair care kit and comes in handy for regular small jobs like smoothing back hair for a sleek ponytail or getting a little natural loft in your roots. Everyone’s hair is different, so what hair care methods work for one person may not work well for others. Fortunately, there are lots of different ways to care for you hair, and there is no right or wrong–only what works for you. Even if you still use regular shampoo and conditioner, using a boar bristle brush on your “off” hair-washing days works wonders! If you are interested in no shampoo/product haircare, there are lots of blogs, videos, and tutorials to help you, for example Tara Creel (who has hair similar to mine) has a full series on YouTube about her 1 year without shampoo journey. 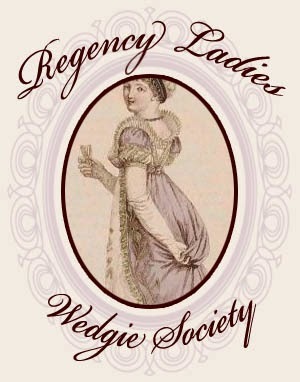 There are also plenty of blogs about historical haircare and cosmetics, like On Living History’s series about 18th century hair products and styling. ‹ PreviousPinterest Alert: Have You Pinned These? Double Check Your Sources! Next ›The Dress that No One Can Wear GETS WORN! Actually, modern shampoo isn’t really for the hair at all. It is supposed to be for the scalp. But most people don’t really realize it. And conditioner is for the hair. To combat all the damage we do to hair. And all those commercials that imply that a thick rich lather proves the shampoo works or proves the quality of shampoo is also wrong. The ingredients to get that lather are actually the ingredients that are worst for your hair. I just bought shampoo and conditioner because I totally forgot, while in the store, I was planning to look for the one I read about that was non-lathering and recommended only shampooing once or twice a week. Because I really want to try to go shampoo free and see what it does for me. This is my favorite entry of yours that I’ve read so far. You did a very thorough and revealing study…well done! The discussion about the types of bristles and products is key, and any people simply don’t realize how marketing has changed our habits over time. Excellent work. BTW, the image I use for my avatar here is from 2009, just before I began growing my hair in earnest. Interesting read. I have very long and very fine and thin hair. I only ever try to use a bristle brush as I find it much gentler on my hair and I too do not believe in washing my hair everyday as it just strips to much of the natural oils, and does it really need to be washed everyday anyways! I love this picture you used in your post “Aurelia (Fazio’s Mistress)” by Dante Gabriel Rossetti, circa 1863-73, That is exactly what my hair looks like, except straight. Interesting article. I have my own approach as I was washing my hair every other day because it got so greasy quickly. But I found after I had it permed it didn’t get oily for a week. So I reduced my hair washing to once a week. And my hair doesn’t get greasy so quickly. I also found that toweldrying the hair then pincurling it before letting the slightly damp hair dry naturally helped to prolonging the time between washes too. I try to avoid conditioner, only using it the first time after I dye my hair. I’m finding my hair has got to shoulder length and doesn’t tangle as much (I use 2 different brushes and 2 different combs). Unfortunatly my hair still wants to be dead stright, and struggles to hold a curl without a mountain of product. My Grandmother used the 100 strokes method and she had beautiful hair, she had a natural bristle brush and would finish her hair care routine by placing a piece of silk over the brush head and brushing with that. I stopped using shampoo and conditioner years ago, switching to baking soda as a scalp cleanser whenever needed. Now that I have dreadlocks I maintain that, since being entirely unable to brush my hair leads to dandruff. However, since I went for so long without using chemical cleansers on my hair, I have no problems with my hair becoming greasy like it used to, even though I only wash my hair once a month (washing dreadlocks is an all day ordeal). My hair is currently 45″ long. I wash it once a week with regular shampoo and conditioner. Many of the problems with modern hair is that people insist on blow drying their hair – this only damages the hair and causes a lot of the split end/ frizzy issues. Because the hair is dead, it can take months to repair hair that has been blow dried. Also, diet has a lot to do with how thick and oily your hair is. Vegetarians tend to have thin/balding hair due to the lack of animal proteins in their diet. I used to have an ultra-short pixie cut, and when I started to grow it out I went about 6 months without shampoo. Now I just wash it whenever it’s unbearable (about every 10 days) with a gentle sulfate-free shampoo. I’ve done some very awful things to it in that space of time (bleached it, dyed it, you name it), and I think the washing routine is why it’s not completely frazzled. Occasionally a tiny spritz of argan oil brushed through the ends seems to calm it down when it goes all Hermione on me. I must beg to differ with Isabella. I have been vegetarian all of my life. Over the last several years, since I became vegan, my hair is thicker, shinier, longer and healthier than ever! being a vegetarian maybe not because one would still get the animal proteins from eggs and dairy, but the vegan diet? I have seen life long vegans, many of them, and pretty much all of them end up with acne and dry, thinning, brittle hair. A satin (silk is even better) pillowcase will change your life. Friction free sleep and no tangles in the morning! I’m a bit late to the party here but I’m interested if anyone has some suggestions for me. I have fairly thick, moderately wavy hair that is currently just past my hips. In fact, other than being a bit shorter, it looks almost exactly like the portrait of a woman with her hair down. My current routine is washing about 2x a week with dandruff shampoo and regular conditioner, brushing 1-2x daily depending on whether I need it to look good in the evening, and leaving it in a braid almost all the time, including at night. My issue is that I’d like to go longer between shampoos, or stop using it all together, but if I push it much further than 4 days, I get really flaky and dandruffy. Does anyone have suggestions for getting rid of dandruff with more historically accurate methods than head ‘n shoulders? This was very informative and interesting to read. I love learning the ways people used to live. There is often so much wisdom that we’ve simply let go of as fads changed. I found this blog through Pinterest. Looking forward to reading more!